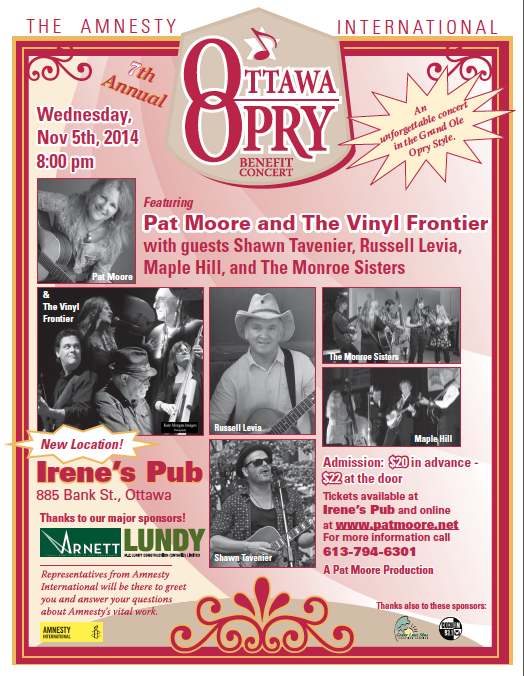 7th Annual Ottawa Opry coming up Nov 5 ! Tickets still available at the door ($22 ) while numbers permit. Please keep your receipt as your ticket. Contact me if you have questions. Thanks! Click on poster for larger view. Thanks to Platinum Sponsor Tracy Arnett Realty, we have donated close to $10K to Amnesty. Every year we have a cast of exciting guest performers. co-producers this year : Spirit of Rasputin's. 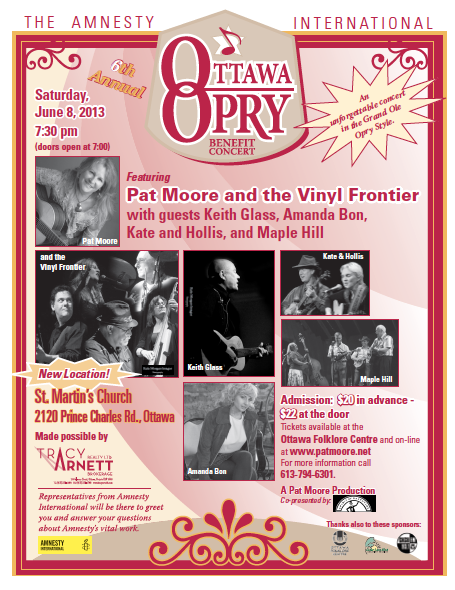 Each year Pat has produced, and with the Vinyl Frontier, performed at the Ottawa Opry, in suport of Amnesty International. Thanks to Platinum Sponsor Tracy Arnett Realty, we have donated close to $10K to Amnesty. Every year we have a cast of exciting guest performers. In the style of the Grand 'Ole Opry, the Ottawa Opry features a jingle for their platinum sponsor. Check out the Sponsor's Jingle on Youtube. BRING THE OTTAWA OPRY ON TOUR TO YOUR COMMUNITY ! Bring the Ottawa Opry on Tour to your community. With musical guests local to your community, you'll be able to support your own while you have a great time. We had a lot of fun bringing the Ottawa Opry to Kemptville Ontario, presented in conjunction with the Kinsmen Club. Everyone had a great time, danced the night away, and raised money for a family in need in the community. 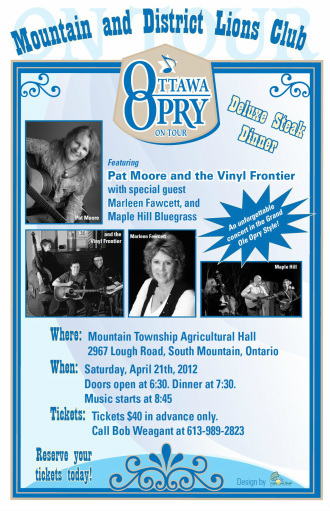 On April 21,2012 the Mountain and District Lions Club will present the Ottawa Opry on tour as neighbours and friends enjoy a "delux steak dinner".